Buffing is almost a dark art in the world of auto detailing: if you believe all the talk about it, it can do anything from removing a small scratch to making the damage from a major collision disappear. In reality, it’s usually the most intensive repair that can be made to existing paint, but it can’t do the same job as a respray. Polishing is a process in which large scratches are covered by smaller and smaller scratches until those scratches are no longer visible to the naked eye. This will keep your car’s paint looking good up to a point, but eventually, the unevenness of the paint surface and damage caused by exposure to the elements will make it look dull. That’s where buffing comes in. Buffing uses polishing compounds, but it removes a thin layer of paint from the surface of body panels, taking scratches and damaged paint along with it. The result is a smooth, fresh paint surface that brings back the car’s shine. When Should My Car be Buffed? If polishing and cleaning your car’s paint isn’t bringing back its shine, it’s time to buff. However, buffing isn’t a one-step process: once the paint is flat, it will still have microscopic scratches that will need to be polished out, and then the tiny scratches left over need to be filled in with a glaze to get the best shine. When you have your car buffed at Merton Auto, we go through all three steps to give your car the best finish possible. Buffing isn’t just for old paint, either. A new paint job won’t have a perfectly smooth surface, so it needs the same care to get the finish you’d expect from fresh paint. Hand buffing – This is simply using a mild polishing compound and a rag to remove paint from a small area. This can level out the paint surface around a minor scratch to make it disappear. Orbital buffing – An orbital buffer spins a foam disc, but that disc also moves in a circular pattern to keep the pad from staying in one place too long. It isn’t as intense as high-speed buffing, so it’s usually used by professionals to do finishing work. High-speed buffing – A bigger pad and higher speeds let a high-speed buffer take off lots of paint at once. This removes major damage quickly, but it can very easily damage the paint. 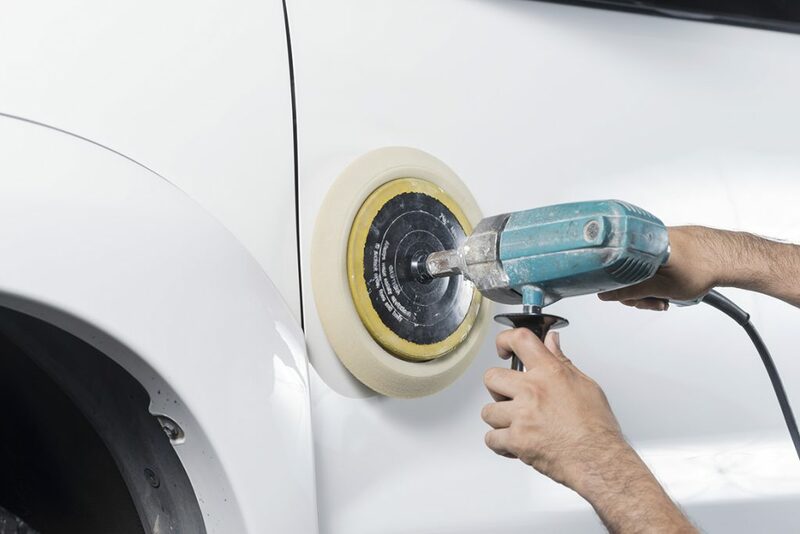 While amateurs may attempt hand or even orbital buffing, high-speed buffing should always be left to the professionals. There’s a lot more to buffing than just how it’s applied. There is a range of buffing pads and polishing compounds that are designed for specific jobs ranging from heavy oxidation removal to finishing, and it takes an expert to know which combinations will deliver the best results. When is Buffing not Enough? The results from buffing can be dramatic, but it’s not a miracle cure-all. There is only so much paint that can be removed: if too much paint needs to be taken off, or if there isn’t enough paint left to survive the process, the surface needs to be repainted. If the paint is severely oxidized, it will appear chalky. At this point, the paint is probably too far gone to be buffed. A deep scratch can penetrate the paint down to the primer or metal. Smoothing out the surface would take off so much paint that the body panel would be left exposed to the elements. For the past 25 years or so, cars have been painted using a clearcoat process. This applies a thick layer of clear coating over the colored base coat. If that layer is damaged, it can flake off, leaving the base coat exposed. The only way to restore the finish is with a new paint job. Where Can I Get My Car Buffed? If you want your car’s scratched paint reworked into a beautiful surface, go to the experts at Merton Auto Body. We’re an I-CAR Gold Class certified body shop with the latest training on factory paint formulations, so we can tell you exactly what can be done to restore your vehicle’s paint. Our ASE certified staff knows how to get the best finish while leaving as much underlying paint as possible.